a) the majority of MPs wants a deal, just not the deal it has been offered by the EU. The House of Commons could just as well have voted that earth would be flat from now on. It can do so but both motions are similarly ineffective. Just so that there are no misunderstandings: one can find the EU’s approach good or bad. However, the EU side has been astonishingly constant! in its approach and hence, not the decisive driver for the FX market. It is driven by the (to put it mildly) changeable approach of British politics. And that side is still not recognizing that the EU’s is likely to be unfaltering in its approach (rightly or not). b) British MPs would like to extend the Brexit negotiations. 1) if MPs will finally agree to the deal that’s on the table since last November next Wednesday there will only be a “technical extension” until 30th June. That seems uncertain as MPs have already rejected this deal twice, for the last time on Tuesday. 2) Otherwise, a significant extension would be required to agree on a new deal. The issue relevant for GBP is: it is neither certain that the EU governments will agree to such an extension (in particular as the divide separating them from the House of Common’s position is as deep as ever); nor is it certain that Parliament itself would agree on a significant extension (which would also entail the UK participating in the European elections in May). As a result, the following still applies at the end of this week: there is still a non-negligible risk of a no deal Brexit on 29th March. It is quite visible as to why the FX market contemplates this risk to be lower than at the beginning of the week so that the stronger pound seems justified. 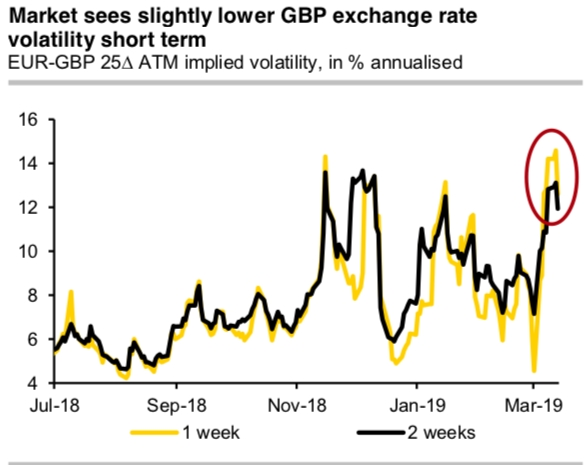 What is predominantly justified though is that the short-term GBP volatilities continue to trade at reasonably high levels as we should have clarity by next Thursday (EU summit). It seems to be slightly perplexed that the 1-week risk reversals in both EURGBP and GBPUSD are trading close to zero. If there was going to be no deal, we have to expect very considerable GBP weakness. It there was to be a delay a risk premium for GBP would still be justified, as a postponed no-deal Brexit does not completely imply (100%) there is not going to be one at all. Everything all told: for all those who consider “no deal” an unacceptable risk, the GBP options market remains surprisingly attractive. Contemplating all the above aspects and foreseeing upcoming risks events, the shoot-up in the exchange rate volatilities priced in on the FX options market for the coming two weeks might, therefore, turn out to be premature (refer above chart). Please be noted that implied volatilities are highest for GBPUSD (1st nutshell), OTM volumes index is also the highest (refer 2nd chart) with fresh positive additions to the bearish risk reversals (2nd nutshell) across all the tenors. Otherwise, the situation for Sterling has changed a bit as we are still left in the dark phase as to the question of whether we will see Brexit and if so when and in what shape. The answers to these questions will determine the fate of the British currency. Currency Strength Index: FxWirePro's hourly USD spot index is flashing at -41 (which is bearish), GBP is at 93 (bullish) while articulating at (11:23 GMT).